GS — “a teacher in the best sense of the word” — was a prolific writer “with an ability to cut through the technical superstructure to essential detail only” without of course, losing the nerve center of the methods being explained. “No economist engaged in econometric research fails to study one or the other books of GS Maddala”, said a professor once on the sidelines of a seminar. He went on to say that it is his extraordinary ability to synthesize and exposit “complex methodological results in simple intuitive terms” in his numerous books and articles that made GS Maddala one of the most distinguished econometricians of our time. Thus getting curious of him, as I googled a little, I realized that we would be remiss if we do not read about his inspiring role as a teacher, ardent econometrician, and his very remarkable life … and hence this story. Gangadharrao Soundalyarao Maddala, universally known as ‘GS’, was born in India on May 21, 1933 in a family of very modest means. He obtained a BA in Mathematics from Andhra University in 1957 and MA in Statistics from Bombay University in 1960. He went to the US as Fulbright scholar and joined the Department of Economics at the University of Chicago from where he obtained his PhD in 1963 by writing his dissertation on the topic “Technological Change in the Bituminous Coal Industry, 1919-1954” under the supervision of Prof. Zvi Griliches. After obtaining his PhD from Chicago, GS wrote 110 articles and authored 12 books covering almost every emerging area of econometrics. He made extraordinary and pioneering contribution in almost all areas of econometrics: distributed lags, generalized least squares, panel data, simultaneous equations, errors in variables, income distribution, switching regressions, disequilibrium models, qualitative and limited dependent variable models, outliers and bootstrap methods, unit roots and cointegration methods and Bayesian econometrics, and many other areas of econometrics. He had, of course, not limited himself to just pure methodology. He had also examined estimates of production function and liquid asset demands, returns to education and discrimination in loan markets, and the meaning and issues in estimation of rational expectations models. So immense was his span of work, yet in his typical Indian philosophical style, GS used to say that he never made any hard decision to do anything in particular in life, rather he had stumbled onto them. Though he said that in his usual self-deprecating style — an attitude that he perhaps cultivated being influenced by Indian philosophy that “nothing matters” — a peek into his early background and his journey through econometrics as indeed narrated by him in one of the interviews, reveals that he had nevertheless, put his best effort to make whatever that he had tumbled upon meaningful and fruitful. And that is what encourages us to read his journey. When he was eight years old, his worried mother sent him with her brother to Bombay to get GS educated from a good school. He took him to King George school. As he scored zero in the admission tests conducted for fifth grade and second grade, they denied him admission. He therefore returned home. Staying at home for three years he worked on maths, reading and writing. Later at the age of 11 he joined high school. At the age 14, he passed high school examination but failed to get the Sanskrit scholarship that he aspired for to join college. Then joined a college in Bombay but due to ill health returned home. In 1948, his mother died. On her death, his father quitting his job moved to their native town in South India. There GS helped his father in his tutorial school. He was also reading history and Indian philosophy books by borrowing from the local library. In 1953, a friend told him that one could get a 2-year college degree at Ajmer — a town 1000 miles away from his home — without going to college by simply writing an exam in three subjects. Lured by the possibility of getting a teacher’s job with that degree, he and his friend prepared for the exam. Due to his friend’s father’s death, he had to go alone for the exam. Purchasing a third-class railway pass for 30 that permitted him to travel unlimited for one month, he went to Bezawada railway station from Kakinada (his home town) to board Grand Trunk Express bound for Delhi. But in Bezawada, he could not get into the train for it was jam-packed with people blocking doors and windows. And if he did not get in, he would miss the exam but that is not what bothered him most: as the train started, it was his missing the opportunity to visit the railway exhibition in Delhi and his 30 rupees railway pass going waste that bothered him most. However, to his luck, a porter approached him proposing to put him in the train if he paid half a rupee. He agreed and as promised the porter lifted him with his bag, all weighing around 115 pounds, and threw him inside the moving train through a window that had no grill in those days. Thus, he went to Ajmer and wrote the exam. He passed the exam standing first and won a gold medal too. Then he joined a local college to major in Maths. In 1955, he completed BA standing university first and also won two gold medals. Then as a professor advised him about bright prospects for job with an advanced degree in statistics vis-à-vis maths, he went to Bombay to do his Masters in Statistics, which he finished in 1957 with a first class. As everyone in his class of statistics went to United States for PhD, GS too decided to follow them and he did get an assistantship at the University of California at Berkeley but could not avail it, for he had no money to travel to the US. Then hearing that Fulbright scholarship also provides assistance for travel to the US, he wrote its competitive examination and got selected. 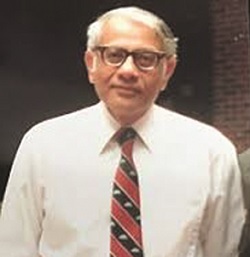 Thus as he was getting ready to go to Berkeley to do his PhD in Statistics, the then director of School of Economics, Bombay, advised him to do PhD in economics arguing that India is already flooded with too many theoretical statisticians because of which he may at best get a lecturer post with even a PhD from Berkeley. Further, promising him Professorship if he returns within three years with a PhD in economics, he advised him to go to University of Chicago instead of University of California, Berkeley. Encouraged by the offer, GS came to University of Chicago in 1960 and enrolled for PhD in economics without knowing anything of economics. After passing the qualifying examination he went to Robert Basmann for a thesis topic. But learning that the topic suggested by him — “Non-Existence of Moments for GCL Estimators” — being difficult, would take 3-4 years, and as he was interested in going back to India at least by 63 to capture the offer of Professorship, he approached Zvi Griliches and finally wrote his thesis on productivity and technical change in the US bituminous coal industry — interestingly using horsepower as a proxy for capital — and obtained his PhD in 1963. After obtaining PhD, GS joined Stanford University in 1963 as Assistant Professor. One day, while having a drink at the Top of the Mark in San Fransisco, reflecting on how his life had changed in a decade — in 1953 he was a college dropout and in 1963 he was an Assistant Professor in Stanford University — wondered what his mother, had she been alive, would have thought about her son going to America and what his life would have been had that porter in Bezawada not dumped him into the GT Express in 1953 for half a rupee. At Stanford, he met Paul Baran, a Marxist economist who advised him to work on important problems of Indian economy instead of wasting his youth on spectral analysis. As fate would have it, on the next day when GS went to see Baran for a discussion on growth topics for undertaking research, it was said the he died of heart attack the previous day. “Thereafter, I had given up Indian philosophy and Indian economic development and tumbled into econometrics”, said GS. Once he entered econometrics, there was no looking back. Talking about his work on production functions, he said that his thesis had not much of econometrics, for it simply estimated Cobb-Douglas functions by OLS. Later, watching the usage of different functional forms (CES and others) for computation of production functions, he argued in his paper, “A Note on the Form of the Production Function and Productivity” (1979), that it did not make much difference what functional form was used. Subsequently, watching the developments in the area of frontier production functions, he, depicting his unique capacity for utter candor, voiced his skepticism in his paper, “Technical Change, Frontier Productions and Efficiency Measurement” (1979), which was of course “largely ignored”. Enthused by the popularity of Koyck model, he, turning his attention to distributed lags, worked on Jorgenson’s rational lag model and estimation of the distributed lag models in the distributed lag and autoregressive forms. Later entering into panel data analysis, he offered clarification regarding the usage of variance components models in panel data. Realizing that all the literature on panel data is (based on pooling the information in the different cross-section units) silent about the question: whether or not to pool, he had discussed this issue in one of his papers in 1991. Later in a 1997 paper, he offered a discussion of all the different methods, viz., classical, empirical Bayesian and Bayesian methods used in pooling in panel data analysis. Later, looking at the growing work on panel data unit root tests, he voiced his criticism about the purpose of these tests that involved a lot of algebra and less about purpose of using these tests in his book Unit Roots, Cointegration and Structural Change. 1. Econometrics. New York: McGraw-Hill, 1977. (Spanish edition, 1985). 2. Econometric Studies in Energy Demand and Supply (edited). Praeger Special Studies. New York: Praeger Publishers, 1978. 3. Limited Dependent and Qualitative Variables in Econometrics. Cambridge: Cambridge University Press, 1983. 4. Introduction to Econometrics. New York: Macmillan, 1988 (Second edition, 1991; Japanese edition, 1992). 5. Microeconomics: Theory and Applications. New York: McGraw-Hill, 1988 (Spanish edition, 1990). 6. Econometrics of Panel Data (edited). Vols. 1 and II. Aldershot, UK: Edward Elgar, 1992. 7. Handbook of Statistics. Vol. 11: Econometrics. (Co-editors). Amsterdam; North-Holland, 1993. 8. Econometric Methods and Applications: Selected Papers of G. S. Maddala. Vols. I and II. Aldershot, UK: Edward Elgar, 1994. 9. Statistical Methods of Econometrics and Quantitative Economics. (Co-editor). Oxford: Blackwell, 1995. 10.With C.R. Rao. Handbook of Statistics. Vol. 14: Statistics Methods and Finance. Amsterdam: Elsevier, 1996. 11.With C.R. Rao. Handbook of Statistics. Vol. 15: Robust Inference. Amsterdam: Elsevier, 1997. 12.With I.-M. Kim. Unit Roots, Cointegration and Structural Change. Cambridge: Cambridge University Press,1998. Reflecting on his interest in the area of Bayesian inference, he once said that being discouraged by the fact that his paper “Weak Priors and Sharp Posteriors” (1972) — in which he argued that the Geisser noninformative prior had the consequence of producing neat, nice posterior in underidentified systems — took four years for getting published in Econometrica, he did not do any more work in that area. But revisiting it in the 90s and believing that the controversy between Bayesian and classical econometricians is largely unnecessary, he reviewed the Bayesian approach to unit roots in his book Unit Roots, Cointegration and Structural Change. He once said that though he is “not a die-hard Bayesian”, he still “like[s] to think about the Bayesian solution to each econometric problem.” Observing that Bayesian approach is not a religion for him, GS, in his characteristic sense of wit and humor, quoting what someone once said, “Bayesians are like Hare Krishna people. If you get too close to them, you become one of them”, stated that kept himself away. When asked about his interest in limited dependent variables, he said it is more owing to Forrest Nelson and Lung-Fei Lee who did their PhD dissertation under him in the area of limited dependent variable models and two-stage estimation methods, respectively. He along with Nelson published a paper on disequilibrium models and wrote another paper jointly with Nelson on specification errors in limited dependent variable models, but somehow never published, though it was cited in a number of publications. And all this finally culminated into his writing an influential textbook on the subject in 1981: Limited Dependent and Qualitative Variables in Econometrics — which is now regarded as a classic and seminal text for advanced studies in econometrics — the manuscript of which was turned down by many publishers stating that it has no demand, but finally published by Cambridge University Press in 1983. Drawing our attention to his paper, “Pseudo Data: Problems of Design and Statistical Analysis” of 1982, in which he discussed what to simulate, why to simulate and how to simulate, he offered a subtle advise to fellow researchers: “One should step back and think why we are doing what we are doing” that merits every researcher’s attention even today. University of Florida – Graduate Research Professor and the Director of the Center for Econometrics and Decision Sciences (1975-1993). Ohio State University – University Eminent Scholar Professorship in the Department of Economics (1993-1999). Held visiting appointments at Cornell, Yale, CORE, Monash, Columbia, the California Institute of Technology (as the Fairchild Distinguished Scholar), and many other institutions. It was again initiated by his students that GS had worked on bootstrap methods and published two papers with his student, Jinook Jeong: “A Perspective on Application of Bootstrap Methods in Econometrics” in 1993 and “Testing the Rationality of Survey Data Using the Weighted Double-Bootstraped Method of Moments” in 1996. Later, from Ohio, he continued his work in this area of bootstrap methods for cointegrated systems with his student Hongyi Li and published four papers with him. He also aired the hope that future research in bootstrap methods will throw more light on small sample inference. Having thus worked in almost every area of econometrics and having written influential textbooks, GS had indeed become a veritable textbook himself for the students of econometrics. He had been “a mentor and a source of inspiration” to more than 50 doctoral students whom he had supervised over the years. As a true teacher who is supposed to be a seeker of truth, he never hesitated “to go against the tide of the profession.” His students consider him as a teacher in the best sense of the word. This ardent practitioner of econometrics, who once said that he was greatly influenced by one of Tolstoy’s short stories, “What Men Live By”, ever remained conscious of the question: “Are the questions being answered are worth asking?” And this philosophy well reflects in his advice to young researchers: “Think first why you are doing what you are doing before attacking the problem with all of the technical arsenal you have and churning out a paper that may be mathematically imposing but of limited practical use”, which holds well even today and why, even for ever. GS — who had been one of the top five most cited econometricians during each of the years 1988-93; who talked about econometrics with his all-pervading humor: sometimes the solution offered [by econometric research] is what I would call a Laurel and Hardy solution: as in the case of panel data unit root tests we witness the initial question is transformed into an entirely different question and a solution offered — though states that “he never made any hard decision to do anything in life, he just tumbled onto them”, his life journey clearly testifies that no matter on what you tumble on, if only you make use of it with all sincerity, you are sure to be of value to yourself and to the people around you. And that is the take home for us from the saga of his life.